This post used the beta endpoint of the Microsoft Graph which no longer seems to be working. 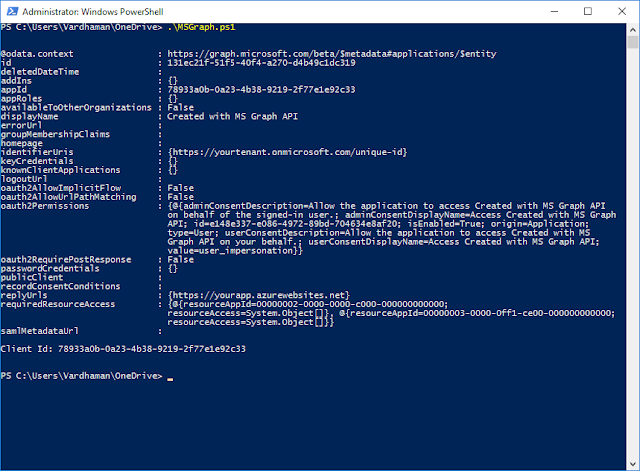 In my previous post, we had a look at how to authenticate to the Microsoft Graph API in PowerShell. 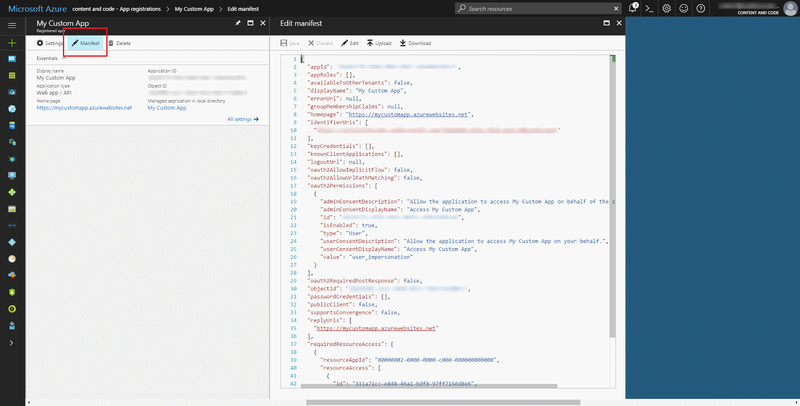 In this post, lets have a look at how we can use the Microsoft Graph REST API to create an Azure AD App registration. 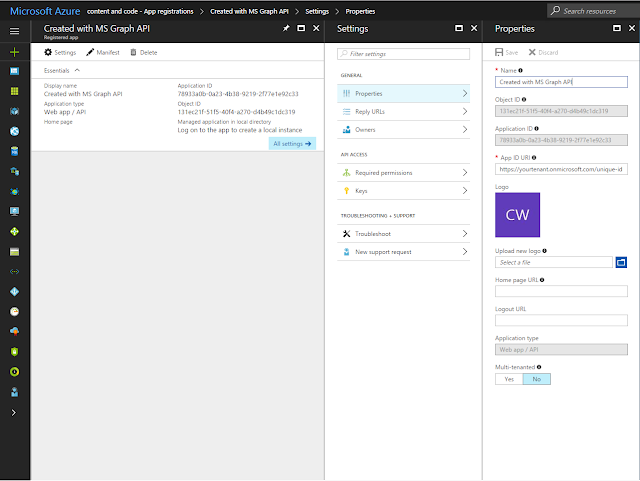 You need to create an App Registration in Azure AD if you have code which needs to access a service in Azure/Office 365 or if you are using Azure AD to secure your custom application. If you have been working with Azure/Office 365 for a while, chances are that you already know this and have already created a few App Registrations. I was working on an Office 365 project recently where we had some WebJobs deployed to an Azure Web App. These WebJobs processed some list items in SharePoint Online. So naturally, we needed to use an Azure AD app to grant the WebJobs access to SharePoint Online. For deploying this application, we were using Azure ARM templates and executing them from PowerShell. With ARM templates, we were able to deploy the Resource Group, App Service Plan, and Web App for the WebJobs. But for creating the App Registration, the two options available to us were the New-​Azure​Rm​AD​Application cmdlet which is part of the Azure Resource Manager PowerShell or the /beta/applications endpoint which is part of the Microsoft Graph API. We found that the New-​Azure​Rm​AD​Application cmdlet is limited in features compared to the Graph API endpoint. For example, you can create an App registration with the cmdlet but you cannot set which services the app has permissions on. For setting that, you need to use the Microsoft Graph API which has the full breadth of functionality. That is why going forward, the Microsoft Graph should be the natural choice for creating Azure AD app registrations. The way we are going to create the app registration is by making a POST request to the /beta/applications endpoint. The properties of our Azure AD app such as it's Display Name, Identifier Urls, and Required Permissions will be POSTed in the body of the request as JSON. Once you have the required JSON, you can delete the manually created app. Going forward, when deploying to another tenant (or the same tenant again), you can just run the following PowerShell script and won't have to create an app registration manually again. Here is the PowerShell script you will need to create the Azure AD App Registration. I should mention that the Directory.AccessAsUser.All scope is needed to execute the /beta/applications endpoint. What is happening in the script is that we are using the Get-MSGraphToken function to get the access token for the Microsoft Graph with ADAL. Then using the token, we are making a POST request to the /beta/applications endpoint. The JSON posted to create the app is pretty self explanatory in terms of displayname, identifier urls and reply urls. Your app might need permissions to different services. Just configure the permissions manually as required and then download the JSON from the Manifest. Or if your application needs to be trusted by each user individually, you can skip this step. The user will be presented with a consent screen when they land on the application. Hope you found this post useful. Thanks for reading! 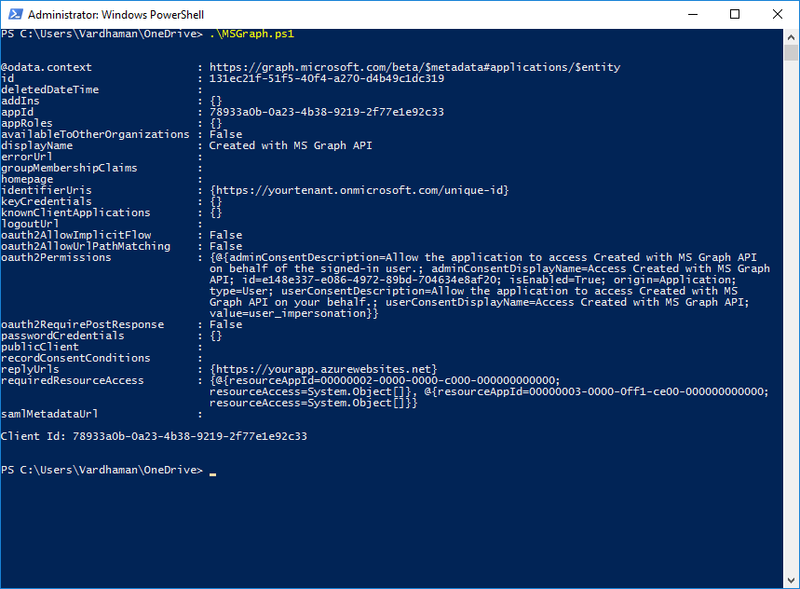 In this post, lets have a look at how we can authenticate to the Microsoft Graph REST API through PowerShell. There are a few examples already available online but either they refer to old endpoints or they present the user with a login prompt to enter a username and password before authentication. A few other examples ask for a client id to be submitted with the authentication request. You can get this client id when you register a new app in Azure AD. But what if you don't want to create an app registration? You already have a username and password, so creating a new Azure AD application just for authentication seems redundant. Fortunately, there is way to authenticate to the Microsoft Graph API without any login prompts and without the need to create an explicit Azure AD application. To avoid using any login prompts, we will use the AuthenticationContext.AquireToken method from the Active Directory Authentication Library (ADAL). To avoid creating a new Client Id and Azure AD application, we will use a well know Client Id reserved for PowerShell: 1950a258-227b-4e31-a9cf-717495945fc2 This is a hard coded GUID known to Azure AD already. 2) Use the username, password and PowerShell client id to get an access token from ADAL. 2) Use the access token to call the Microsoft Graph REST API. In this post, lets have a more in-depth look at how to actually get the current SharePoint context in your service, without passing it in explicitly. To summarise, it is recommended to consider other alternatives first before using ServiceScopes. Other alternatives include explicitly passing in dependencies like SPHttpClient in the constructor of your service, or if your service has multiple dependencies, then build a class which has all the dependencies as properties and then pass an object of the class to your service's constructor. While these recommendations would work in some scenarios, they might not be viable in all conditions. If you are building your service as an npm package, passing in the current context every time you want to use the service might be very burdensome. Ideally, your service should be able to determine all the information about the current context on its own. So lets have a look in this post on how do to that. Now that you have decided to build an SPFx service using ServiceScopes, lets have a look at how to get the current context in your service without passing it in explicitly. First, you need to build a service which accepts a ServiceScope object in the constructor. This is the only dependency your service will need. Also, you will not need to explicitly pass in this dependency. SharePoint Framework will handle this for you. First, we are importing the SPHttpClient class from the @microsoft/sp-http package and the PageContext class from the @microsoft/sp-page-context package. These classes expose their own ServiceKeys, so in the constructor of our service, we are using those keys to grab an instance of these classes. These instances of classes will already be initialised thanks to the ServiceScope.whenFinished and ServiceScope.consume methods. We can then use the instances in the methods of our class. Thanks for reading! Hope you have found this post helpful.